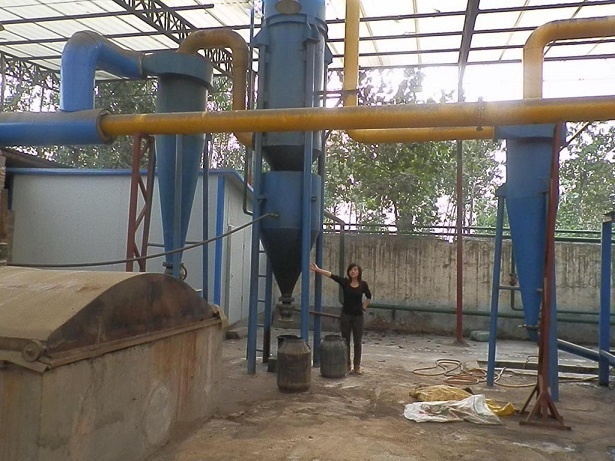 Biomass combustion gas and charcoal production line can not only produce biomass combustion gas, but also produce biomass charcoal, wood tar, pyroligneous liquor. 1000 KG biomass raw materials can produce biomass combustion gas 300m3，biomass charcoal 300kg, wood tar 50kg, pyroligneous liquor 200kg. Wood tar: better than coal tar. As a precious chemical raw material, can be used for wood preservative, flotation agent, carbon products additives; Benzene and its derivates (13%), phenol and its derivates (35.5%) can be attracted through fractionation, and used as solvent, dyestuff, medicine intermediate, food preservative, etc. Pyroligneous liquor: Used as crop insecticide, and the seed dipped in pyroligneous liquor can't be eaten by insects; Used as feedstuff additive to improve meat quality and increase Egg Production in Egg-type Chickens; Collecting acetic acid; Cosmetics additives, foodstuff additives; etc. Take the finished charcoal to make packing and selling; The biomass combustion gas are produced from retort, and, through the process of cooling, dust removal, tar removal, filtration, caustic washing and acid removal with the decontamination facility, send into gas-holder and ready for henhouse heating or residents warming and cooking; At the same time,the wood tar and pyroligneous liquor are produced through two stage cooling and separator. 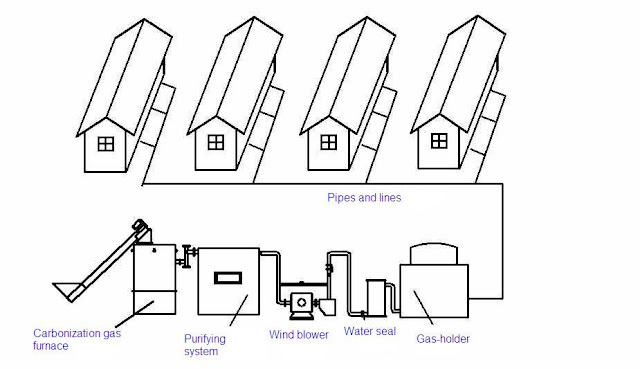 The basic principle of biomass gasification system(abbreviated as BGPS) is to convert Agriculture and forestry products and wood processing remains (including rick husks, wood powder, branches, offcuts, corn straws, rice straws, wheat straws, cotton straws, fruit shells, coconut shells, palm shells, bagasse, corncobs,) into combustible gas . It is then used as fuel in gas engine to generate electricity. 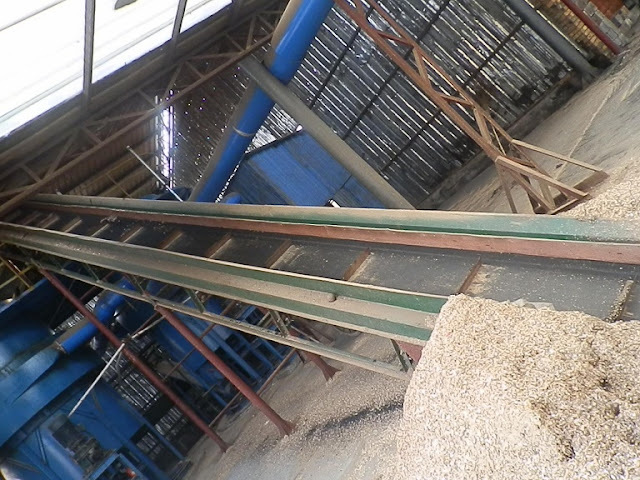 Biomass gasification successfully conquers the disadvantages of biomass, such as low flammability and wide diversity. Biomass gasification system is characteristic of small land requirement and environment friendly. 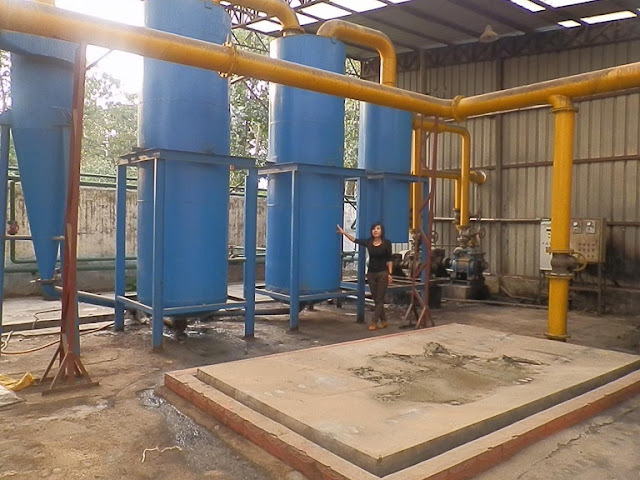 It’s one of the most effective way of biomass utilization. 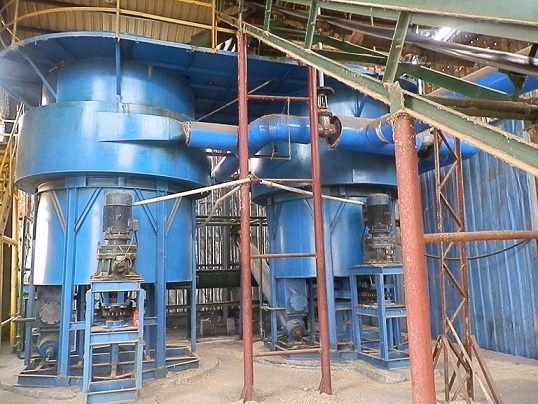 Our biomass gasification process includes three steps. 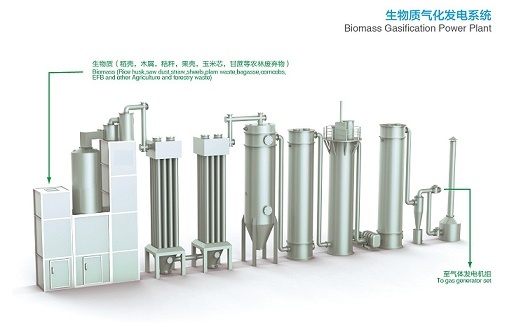 The First step is biomass gasification, which convert biomass into syngas. The Second step is syngas purification. The producer gas coming from gasifier usually contains contaminants including dust, coke, tar and etc. The contaminants will be removed by the purification system to ensure normal operation of gas engine. The Third step is power generating in gas engine. The high temperature exhaust gas may be reused by waste heat boiler to generate steam or hot water for civil or industrial use). Steam turbine may also be considered to make a gas-steam combined cycle power plant, which will increase the total efficiency. BGPS is applicable for the biomass power plant ranging from 100KW to 20000KW. 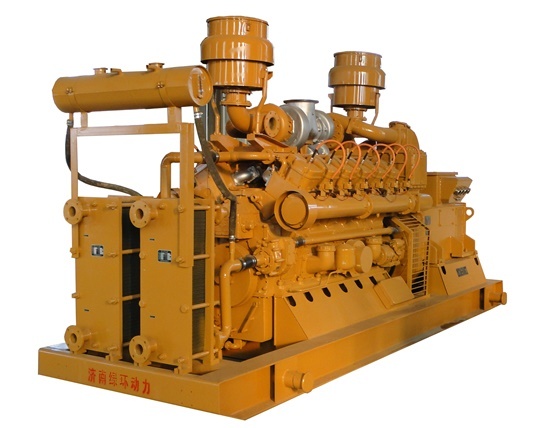 500rpm~600rpm gas engine and Siemens generator are chosen in our gas generator sets (400KW, 500KW, 800KW, 1000KW, 1200KW). Fix bed gasification system or fluidized bed gasification system may be chosen according to different feedstock characteristics in JAE-BGPS (single system capacity ranging from 100KW to 2MW). 1). Flexibility. Gas engine, gas turbine and even waste heat recovery boiler may be used considering various power plant capacity requirements. It ensures high power generating efficiency. Different capacities of biomass power generation plant can be designed with various types of BGPS system. 2). Clean technology. Biomass, as one kind of renewable energy, may reduce the emission of carbon dioxide, sulfur dioxide causing from fossil fuel. Nitrogen oxides emission is very limited in our biomass gasification power generating system because of low temperature (700℃~900℃). 3). Economic. Our BGPS is capacity flexible. 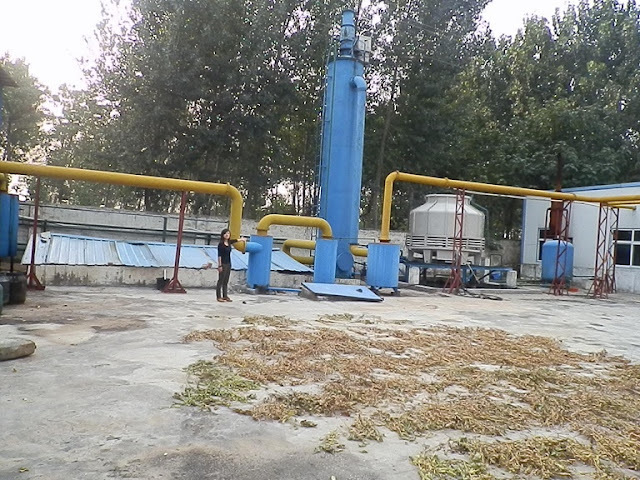 Even small size biomass power plant is also profitable. Simple process and less land requirements make biomass gasification power plant more economic comparing with other renewable energy. Generally speaking, biomass gasification power generating is the most economic technology in renewable power generating plant, the cost of which is nearly the same as small-size conventional power plant. * Modular System, Min 100KW, Max, 1000KW. 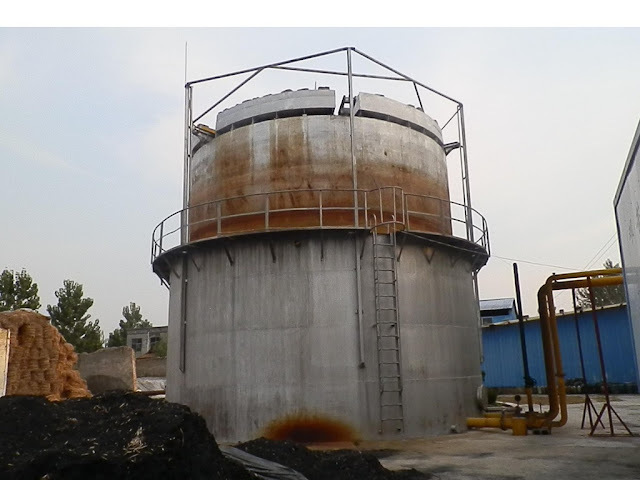 * Equipped with Dry Type Gas Purification system, no dirty water produced, tar can be separated collected. * Ash Discharge Type: dry type. * Material : rice husk,small wood chips and etc. * Humidity of Material : less than 16%. * Modular System, Min 400KW, Max, 1200KW. * High Degree of Automation. 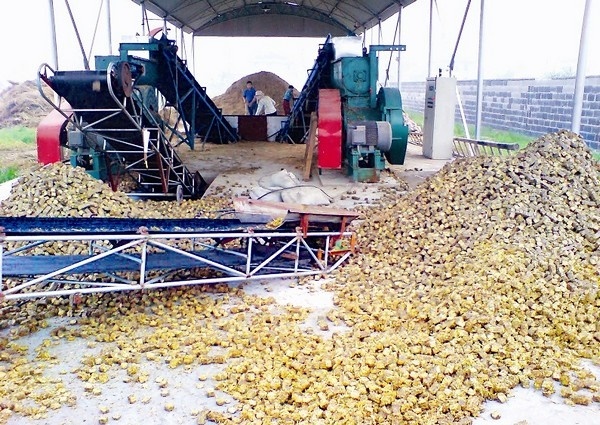 * Material : rice husk, straw, wood chips, saw dust, and any kind of agriculture waste and forestry waste. Please contact us for details price quotation.